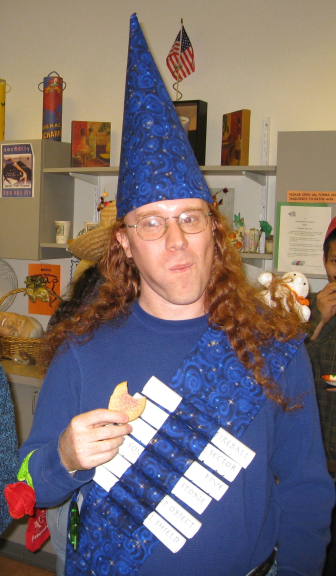 In 2008 my Halloween costume was a wizard from the boardgame Wiz-War. Wiz-War is a game in which players play wizards running around a dungeon trying to steal each other's treasure. I put a good bit of work into the hat and scroll-bandolier but kind of skimped on the rest of the costume. If I was to wear this costume again I'd put some effort into finding a blue robe. I put the most work into the scrolls even though you can only see their names when I'm wearing the costume, unless I take one out to cast it. This page and graphics by Denis Moskowitz. Page created November 23, 2010.